A complete line of flexible chimney liners available in 5 different weight classes to suit any of you chimney lining needs. 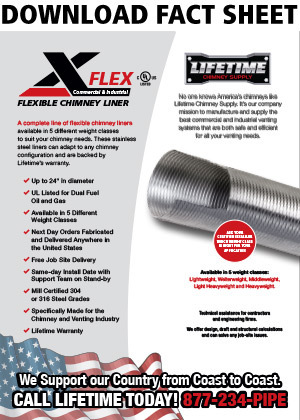 These stainless steel liners can adapt to any chimney configuration and are backed by Lifetime’s warranty. No one knows America’s chimneys like Lifetime Chimney Supply. It’s our company mission to manufacture and supply the best commercial and industrial venting systems that are both safe and efficient for all your venting needs. For more information on our commercial grade products and services, call or email Lifetime Chimney Supply. We are here to answer all of your questions and provide you with the highest level of support for all of your commercial jobs and needs. We also offer technical assistance for contractors and engineering firms which include design, draft and structural calculations that can solve any job-site issues.